The southwestern province of Zeeland is perhaps the foodiest province of the Netherlands, especially if you're into seafood. The province is one of the least densely populated provinces of the Netherlands, with around 380,000 inhabitants compared to e.g. 2.4 million in the neighbouring province of Noord-Brabant. Yet the province counts no fewer than 9 Michelin stars, and therefore has the highest density of Michelin stars per capita in the Netherlands. Zeeland is not just about Michelin stars though, it's also full of casual restaurants where you can enjoy fresh, local seafood, freshly harvested oysters and mussels in particular. 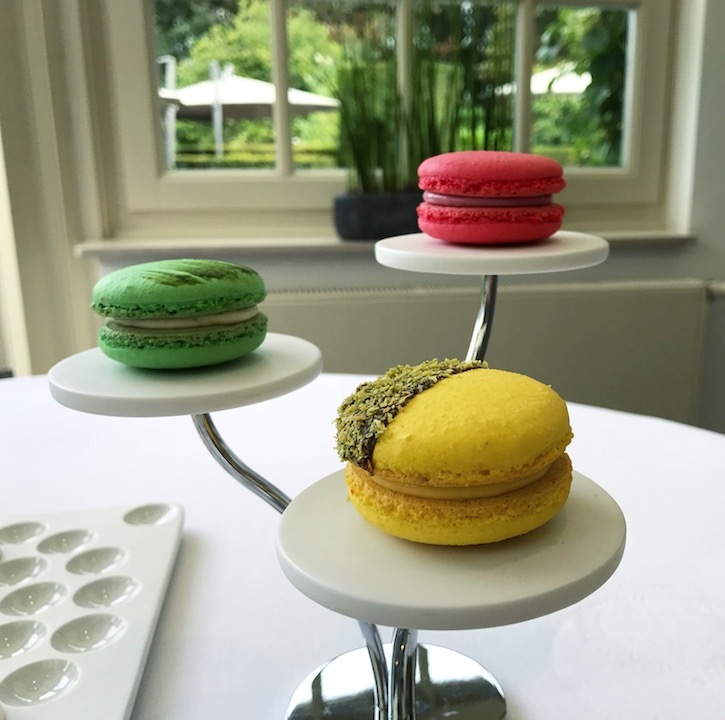 Internationally Zeeland used to be well-known as the home of Sergio Herman's three-star restaurant Oud Sluis until it closed in 2013, but another established restaurant there is Manoir Inter Scaldes in the village of Kruiningen. 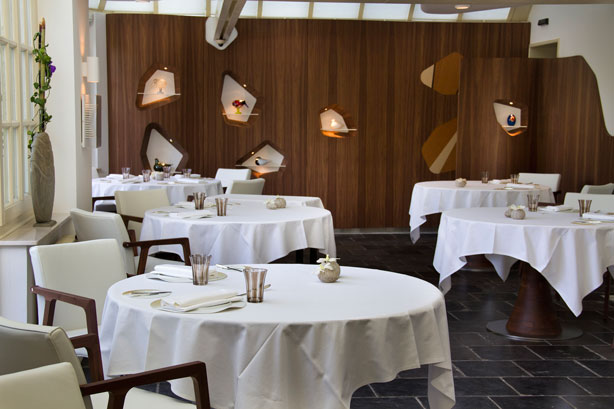 For more than three decades now (since 1984), Inter Scaldes has held two Michelin stars, first under the ownership of Maartje (chef) and Kees (maitre d'hôtel) Boudeling, and since 2001 the restaurant has been run by another husband and wife team, Jannis (chef) and Claudia (maitre d'hôtel) Brevet. The village of Kruiningen is located on Zuid-Beveland, the middle peninsula of Zeeland between the Oosterschelde and the Westerschelde estuaries (Inter Scaldes means "between the Scheldts" in Latin), and is not far from Yerseke, the mussel and oyster capital of the Netherlands. The Manoir, situated right next to the restaurant, houses 12 luxury rooms and suites, and the building also contains the couple's extensive contemporary art collection. First to arrive were three elegantly presented appetisers. Served on a spoon was a delicious soft and sweet pear marshmallow cloud with a hazelnut garnish, and the other two were served in little bowls. 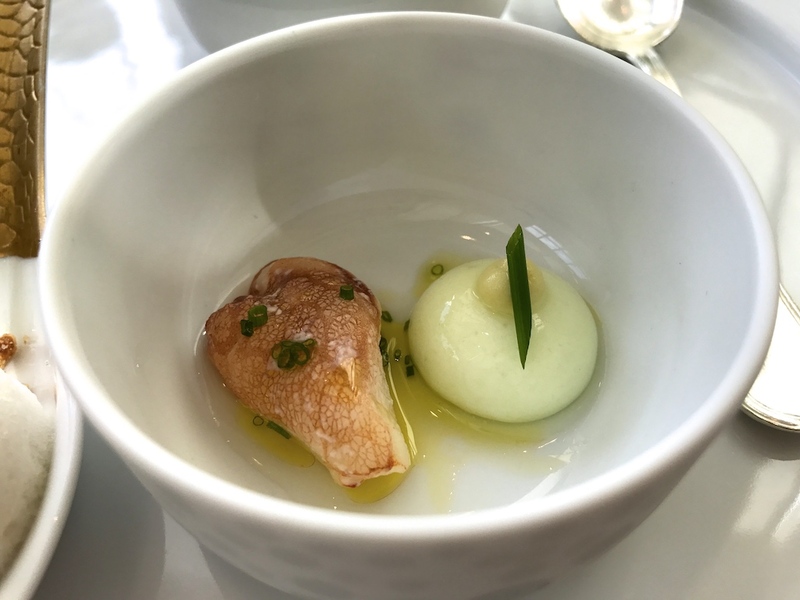 The first one contained a piece of juicy Northsea crab, strained yoghurt and an elegant lavender dressing, the other one contained smooth pea crème, cucumber-infused watermelon, and some dots of red pepper puree. 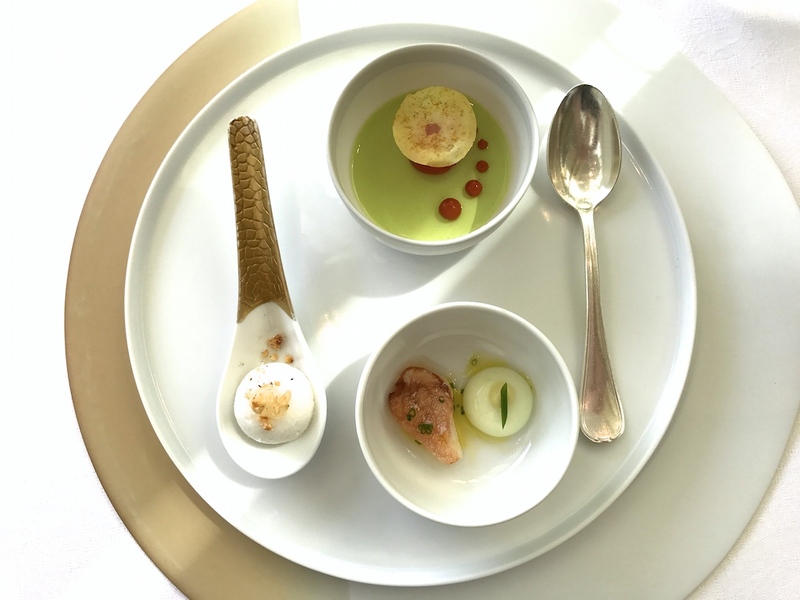 Three superb appetisers, but even better was the cracking, signature amuse bouche based on the classic Caprese. A clear and perfectly seasoned tomato jelly was impeccably adorned with dots of tomato puree, basil puree, mozzarella crème, and olive oil crème. A wonderful flavour marriage, the individual flavours coming through beautifully. 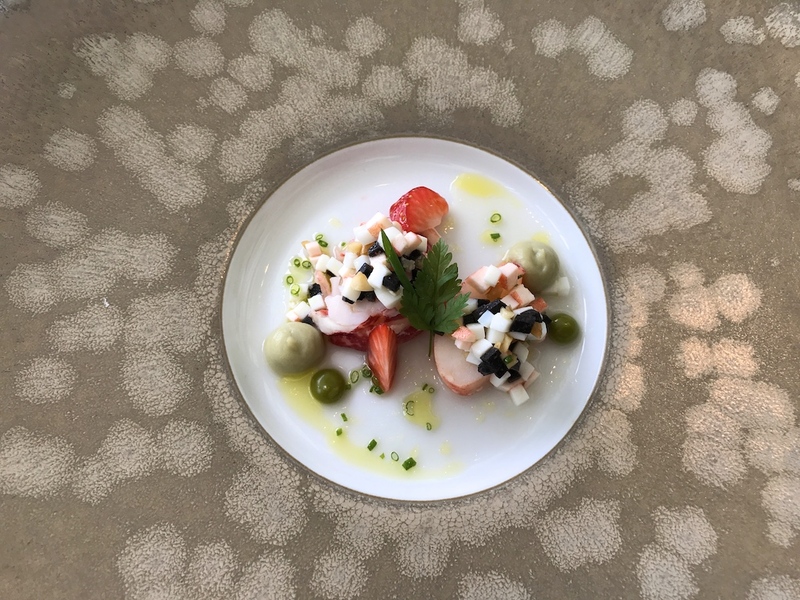 Next was an extra course of skillfully cooked "Oosterschelde" lobster tail, topped with a brunoise of chopped egg white, hazelnut, truffle and claw meat, and served with fresh strawberries, pistachio puree, artichoke puree and a light and buttery dressing. An exquisite dish executed with great precision. Glorious meaty lobster, marrying really well with the brunoise and its sweetness was enhanced by the artichoke puree. Well-judged use of strawberry too, which delivered a nice hint of sweet acidity right at the end. As the first course of the tasting menu came three carefully constructed, decadent little towers of light and silky avocado puree, topped with a delicately flavoured coconut flan, fresh coconut, a lavish spoonful of Anna Royal Dutch caviar, and garnished with a thin chicken crisp. A visually stunning dish with expertly balanced flavours. The avocado puree tasted clean and fresh with a hint of acidity and the coconut flavours were distinct but subtle at the same time. 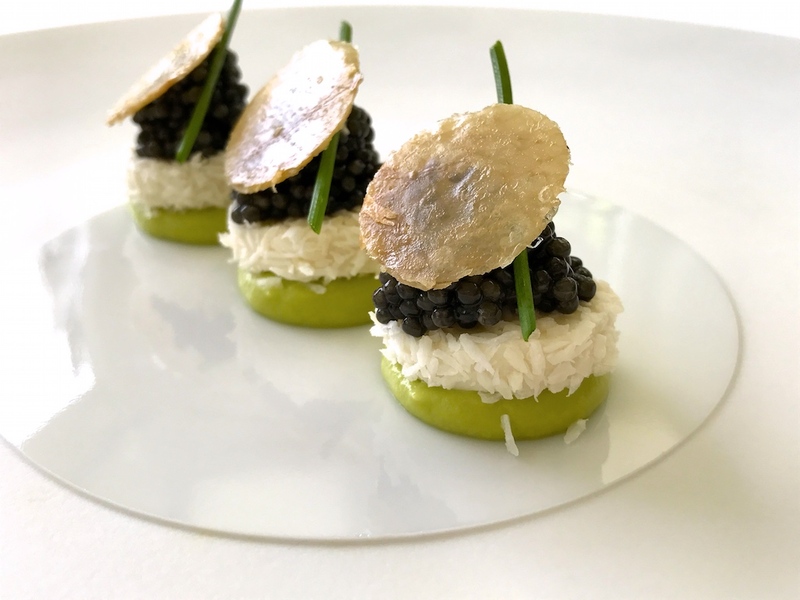 Finally the caviar, its saltiness providing a great contrast for the creaminess and milkiness of the avocado, and the chicken crisp added crunch and extra savouriness. Second course was organic duck foie gras neatly covered with a layer of mildly sweet fig jelly, and served with a nice and pungent fig chutney, which had lovely zesty notes, and a light Jerusalem artichoke puree. A classic flavour pairing, rich but elegant, and I loved the texture of the foie gras, creamy and rich, not too smooth. Two seafood courses followed. 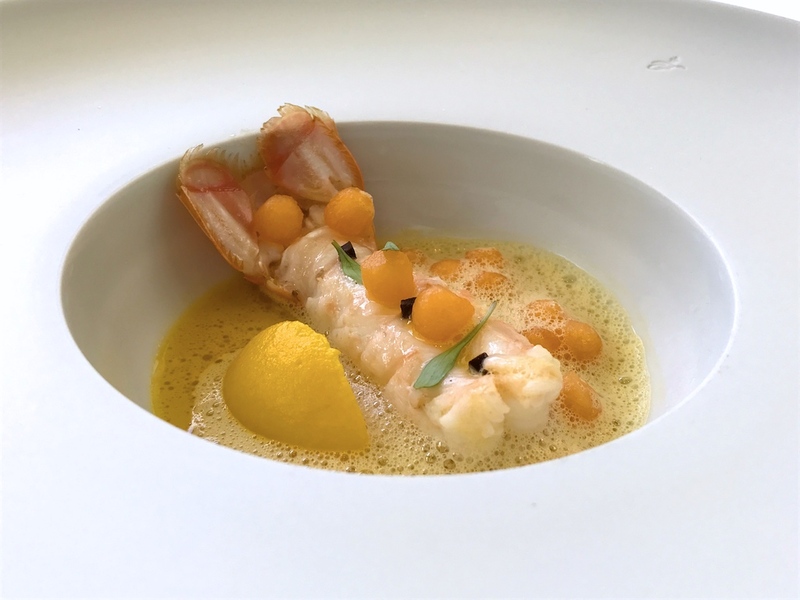 First up was a fat and juicy langoustine served with fruity melon balls and carrot puree, and complemented by a creamy carrot and melon sauce. 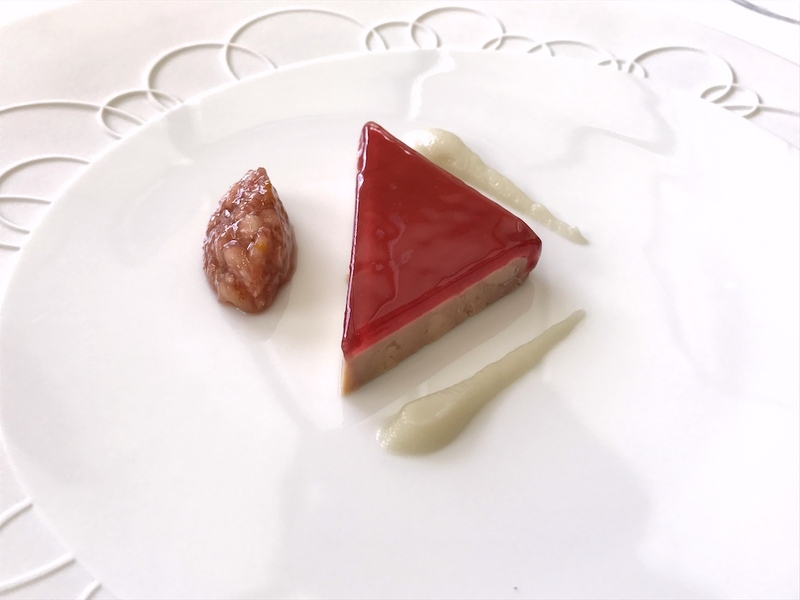 An exceptionally elegant dish with a beautiful synergy of sweet and fruity flavours, the melon balancing the dish perfectly, and the sauce giving it a wonderful, rounded finish. This was followed by a refined take on the classic sole Picasso. A beautiful piece of moist and meaty Dover sole was decorated with little cubes of peach, sliced pistachio nuts, little cubes of black truffle and a few stalks of sea blite, and accompanied by a delicately creamy sauce, gently seasoned with bay leaf and some buttery girolles. Also on the plate was a quenelle of broccoli puree, lightly seasoned with yuzu, which brought a lovely freshness to the plate. 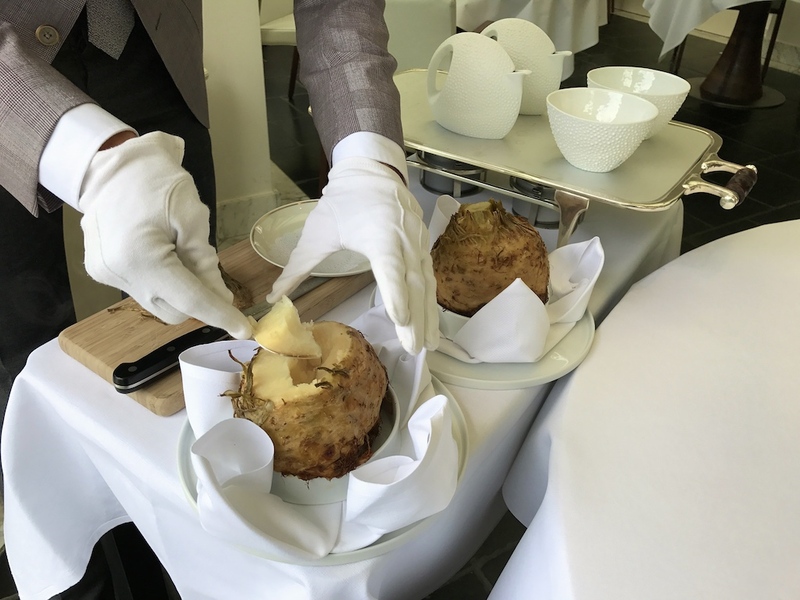 Fifth course was a tableside serving of roasted young celeriac, scoops of its tender flesh simply served with a creamy celeriac extract and freshly sliced Tasmanian truffle. A superb dish, the flavour intensity of the celeriac being absolutely stunning, but also a dish that's all about skill and confidence. Confidence as in knowing when to stop and knowledge of your ingredients; too many additions would have muddled the gorgeous flavours of the celeriac. 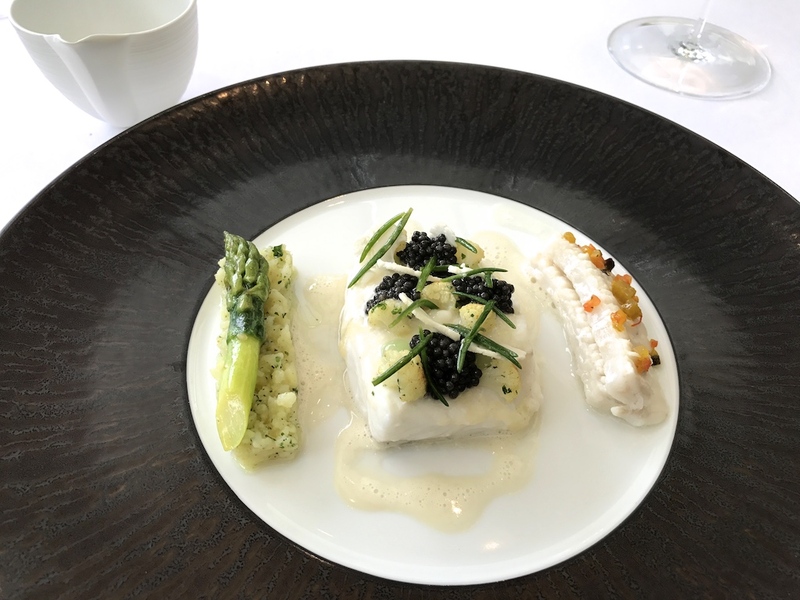 On to the sixth course, an expertly cooked pavé of turbot, garnished with caviar, sea blite, little pieces of slightly crispy potato, and complemented by a creamy toasted bread sauce. Plated alongside the fillet was some more turbot, this time a strip of the meat near the fin, covered with marinated vegetables, and on the other side were some crushed potatoes (cooked in goose fat) with a fat green asparagus spear on top. 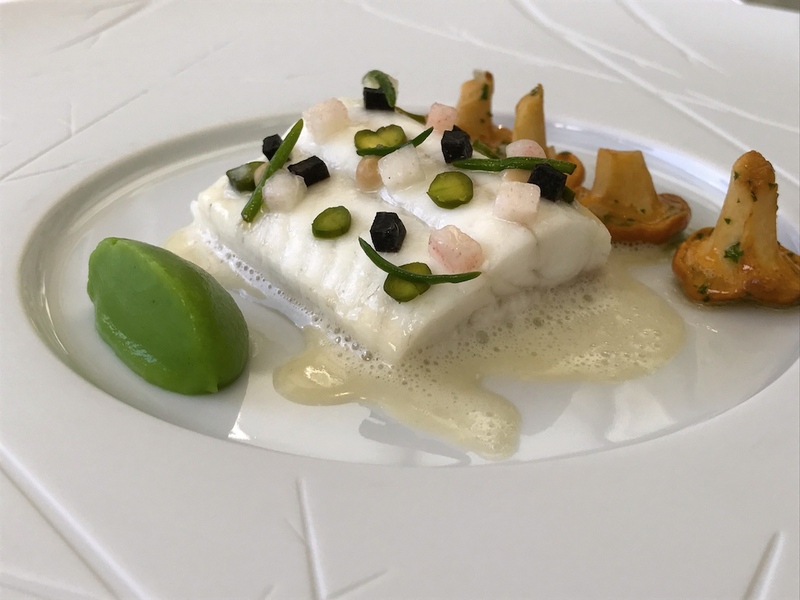 The caviar melted deliciously with the tender turbot, its saltiness bringing out the best of this exquisite fish, but working equally well with the potato. Everything was cooked perfectly with impeccable flavours and the goose fat potatoes added a comforting richness to the dish. *The main course on the tasting menu today was lamb, but since I don't like lamb, I had asked the chef to change it. The meal continued with an orange brandy snap covering a pre-dessert of coffee-like chicory jelly, mascarpone, and buddha's hand jelly. 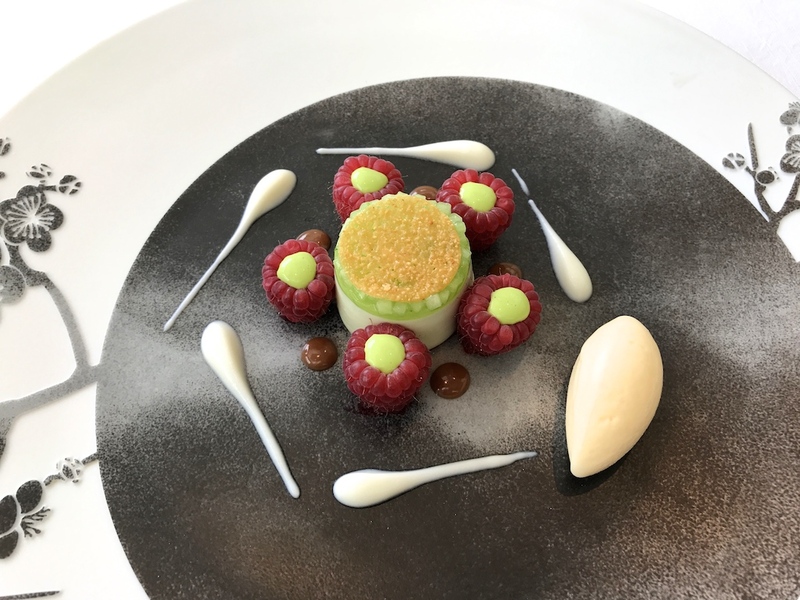 Shortly after, this was followed by a dessert of creamy blanc manger covered with a layer of cucumber jelly and finely diced cucumber, a thin crisp biscuit, and surrounded by a circle of immaculate fresh raspberries filled with a smooth watermint emulsion, and dots of yuzu caramel. On the side of the plate was some yoghurt ice cream. 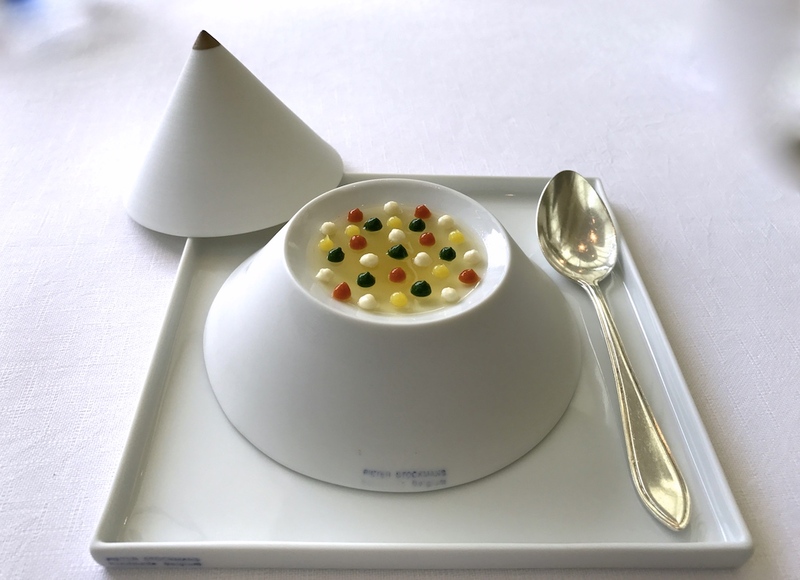 A wonderful dessert with just the right levels of sugar, creaminess and freshness, and a perfectly elegant ending of the tasting menu. On to the conclusion - where do I start? It is always a pleasure to return to Inter Scaldes because they are on consistently fine form, and this meal was yet again of a sensational level. My history with the restaurant starts in November 2009, when I had my first lunch there and as long as I can remember Inter Scaldes has been named in the Netherlands as a candidate for three Michelin stars. 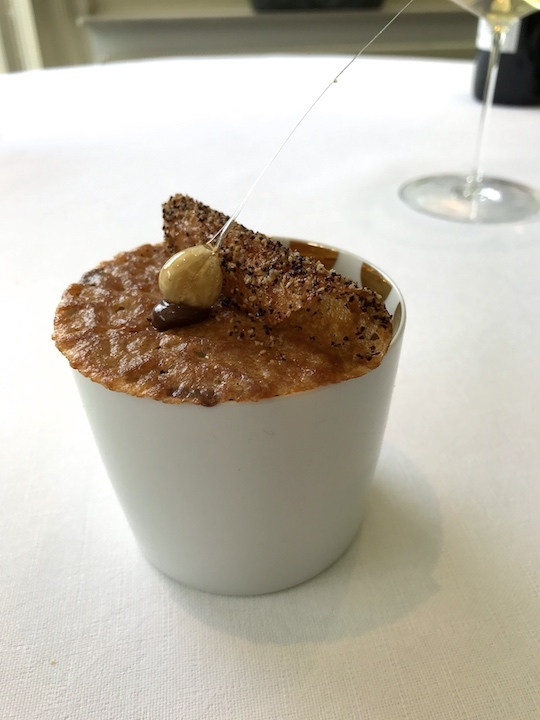 My early meals at Inter Scaldes in 2009 and 2012 were outstanding and certainly at two-star level (see my 2012 review), but the first real three-star sparks arrived on my plate in 2014 (see review). 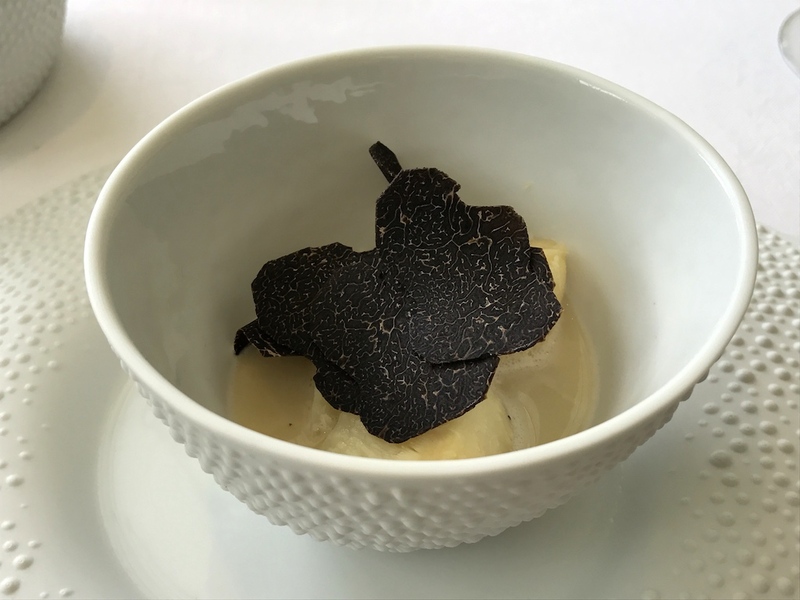 The quality of that meal was confirmed and surpassed by two blockbuster meals in the last 12 months, leaving no doubt that Inter Scaldes is deserving of three Michelin stars. I don't make a habit of comparing restaurants in my reviews, but these meals clearly outshone the ones I had in the previous year at three-star laureats such as Lasarte in Barcelona, Eleven Madison Park and Le Bernardin in New York City, or at that very senior member of the three-star club, The Waterside Inn in Bray, England. And don't get me started about Passedat in Marseille. Chef Jannis Brevet is an outstanding craftsman with an impressive repertoire ranging from intricate, modern interpretations of classic dishes and evergreen combinations of flavours and ingredients (langoustine and caviar will never bore me), to uncomplicated but enchanting dishes, such as today's celeriac dish or pressed caviar with sturgeon cream and beurre noisette (served to me in December 2016). In the last couple of years he has also introduced daring and ingenious flavour combinations into his cooking (when did you last see avocado - coconut - caviar - chicken crisp on a restaurant menu?). Every chef can buy a tin of caviar, it's what you do with it that counts. But whatever the style, the main ingredient is invariably recognisable on the plate (which is not self-evident nowadays), and without exception expertly paired with complementing seasonings and garnishes, although the latter are not always strictly seasonal. Naturally, the location of the restaurant means that there's a strong emphasis on local seafood, pristine produce, the best that Zeeland and often France has to offer and if anything, Brevet is hands-down the finest seafood chef in the Netherlands and one of the best in Europe. The front of house team, led by Claudia Brevet, and including the talented and knowledgeable sommelier Koen van der Plas, is very welcoming and well-organised. If you can, get yourself to Inter Scaldes.